This time of year most kids just want to be outside running around playing. What about the rainy days or days that it is just to HOT ( like here in the south today it's 91 ). With my older boys I find it is hard to find toys that last and also that they will play with! Recently I was introduced to Playmobil and my boys were sent the Dragon’s Dungeon to enjoy. After a little time putting it together, they played for hours with it. As a mom I love seeing their imagination hard at work. One of the "cool" (in their words) features was the blue flame light, the battery was included for it. 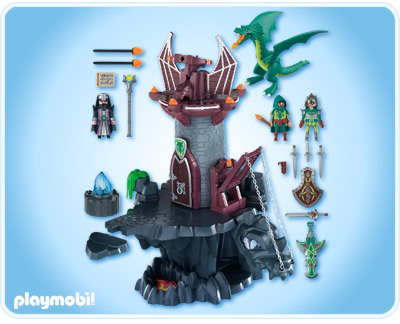 The towering Playmobil Dragon's Dungeon Play Set sits on a rocky outcropping as if it was floating in the sky and features a movable dragon's head gate, crossbow that shoots and a blue crystal light. playmobil toys are so cool! My 2 older boys would love this. I think that blue flame is cool too. I am not a huge Playmobil fan, but these dragons are way cool!